As well as being the first day of EGEE'09, today also marks the release of the 8th GridBriefing from GridTalk. This month's GridBriefing discusses the topic of eHealth. What is it and how is grid technology involved? 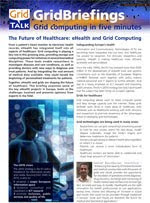 We take a look at the challenges involved in implementing grids for healthcare, as well as showcasing some great projects that already use grid computing for biomedical research, patient treatment and health data storage. With contributions and views from the European Commission, HealthGrid, and Health-e-Child amongst others, the briefing provides an insight into how grids are helping to shape the future of healthcare. To download a copy of this, as well as all our past GridBriefings, just visit the GridTalk site. Or, if you're at EGEE'09, you can pick up a copy from the UK and Ireland stand. While you're there why don't you take a look at some of the health projects that will be in the demo area over the coming week at EGEE'09? RadiotherapyGrid and neuGRID are just a couple of health projects that will be present at the conference. Take a look at the EGEE'09 programme for more details.